The Trojans are in southwestern Ohio this weekend to take on the RedHawks of Miami University in intercollegiate basketball, and it's been an interesting trip already! First of all, congratulations are in order for center Bernard Toombs for not making the team flight out of Atlanta, because he was graduating in front of a LOT of family and friends at Sartain Hall Friday afternoon. He's at left with one of his professors, Teresa Johnson. Bernard caught a later flight and is on hand for this afternoon's game. His place was taken by Lucy, the tiny family dog of the Felix family, who rode up in her dog-carrier to visit with David's son (and former Troy GA) Drew Felix, his wife Heather, and newborn Nash, who live in Columbus, Ohio. Lucy was an outstanding traveler and Nash's big buddy. At the Cincinnati airport (which is actually just over the Ohio River in Kentucky, the guys ran into Darryl McDaniels of Run-D.M.C. and persuaded him to pose for a few photos. 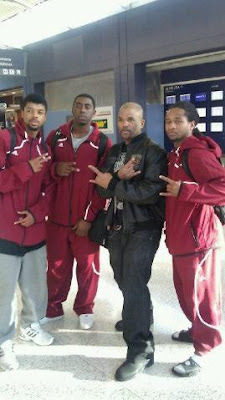 Here he is with (from left) DeAndrae Ross, Steven Cunningham, and Travis Lee. I definitely know Run-D.M.C., but I'll admit I didn't recognize him until I asked! The team is staying in Hamilton, OH, which is near Miami University. After a long run in the 30-degree Hamilton morning, breakfast was in the Ohio Diner, where I was introduced to a southern Ohio delicacy called "goetta" (which is pronounced "getta"); it's a combination of ground sausage and oatmeal. I usually am game to try new experiences, so I ordered it up. I told the waitress it was wonderful, but it tasted like a corkboard. If you ever get to Ohio, just say no to the goetta. Thank me later. Troy looks to take care of business this afternoon in Oxford, OH, against the Miami University RedHawks at 3:30 Central Time, with the air time on the Troy Sports Network from IMG College set for 3pm. You can hear it over the air on WTBF, 94.7FM, in Troy, and WOOF, AM560, in Dothan, plus online coast-to-coast and worldwide at troytrojans.com. I said yes to the goetta before reading this blog and thankfully so. Sad you're not a fan, but that just leaves more for the rest of us.